A customer emailed us recently, asking about an improvement pyramid diagram showing different levels of continuous improvement. It's actually a triangle, I guess. The image is based on some research that is shared in the excellent book The Idea-Driven Organization by Alan Robinson and Dean Schroeder (and I think the data appeared in their earlier books, too). Their research has shown that roughly 80% of improvement potential comes from ideas that are originated at the front lines, the people doing the value-added work. You can see the proportions of ideas and cost savings. They implemented 2 large complex black belt projects, each saving, on average, 750,000 Swedish Kroner, or about $87,000. Each of the 5 green belt projects saved about 200,000 KR. As we go down the pyramid, we have more ideas, each having less impact. At the bottom level, each front line staff idea saved about 4600 KR or $540. Those are small improvements, but they had over 1700 of them!! So, the cumulative impact far outweighed the belt projects of various levels. "Of course, the problem is getting the executives more focused on the bottom of the pyramid. They are naturally drawn to the huge problems that are causing them pain. Why worry about the small ones that aren’t bugging you yet?" This is a very common situation. If you ask many executives how to save $10 million, they might look for one or two big huge projects. Far too many ignore the potential that comes from front-line ideas. I see some organizations in healthcare saving $5 to $10 million a year from implementing front-line Kaizen ideas. And cost savings is, of course, only part of the equation! We have to get past the biases that many people have in thinking that big projects or formal projects are the only things worth working on. Who cares about one $500 project? The person who had the idea! And, the executives should certainly care about not capturing the accumulated benefit of staff ideas. What wastes it is if we don't create an environment where people can speak up and share ideas. In the book, Robinson and Schroeder write about a problem that Coca-Cola struggled with in Sweden, with bottles sometimes blocked their automated lines, which would cause bottles to crash together, sending them flying at a rate of ten bottles per second (!). "Two Six Sigma black belt teams had failed to solve the problem," they write. They continue, "Ironically, after the black belt teams failed, the problem was solved by a simple idea from one of the bottling-line workers." I don't mean to knock Six Sigma or formally-trained belts. The story just goes to show that sometimes front-line staff have the answers if we ask them. Many organizations have a bias to start FIRST with complex problem-solving methods and experts. It's better to start first with front-line staff... only then escalating complex or sticky problems to the specialists. "Armed with this insight [that 76% of improvement $$ came from staff ideas], the company increased its emphasis on employee ideas; and in 2008, this percentage increased to 83 percent. In 2010, the company stopped tracking the cost savings from front-line ideas because the financial benefits from them were clear. 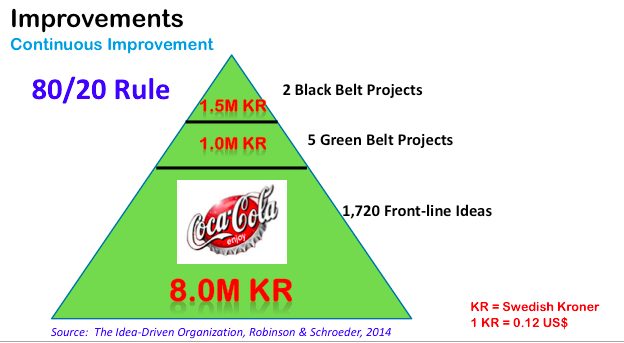 All these ideas helped Coca-Cola Stockholm surpass its peers in almost all the primary performance categories for bottling plants. Globally, it ranked first in productivity, quality, safety, environmental performance, and customer fulfillment rate." "The Coca-Cola improvement data reflect what we have come to call the 80/ 20 Principle of Improvement: roughly 80 percent of an organization’s performance improvement potential lies in front-line ideas, and only 20 percent in management-driven initiatives." What can you do in 2016 to tap into latent staff ideas? If you're not capturing and implementing these ideas, what can you do differently? What questions do you have? Please post a comment or let us know if we can help.